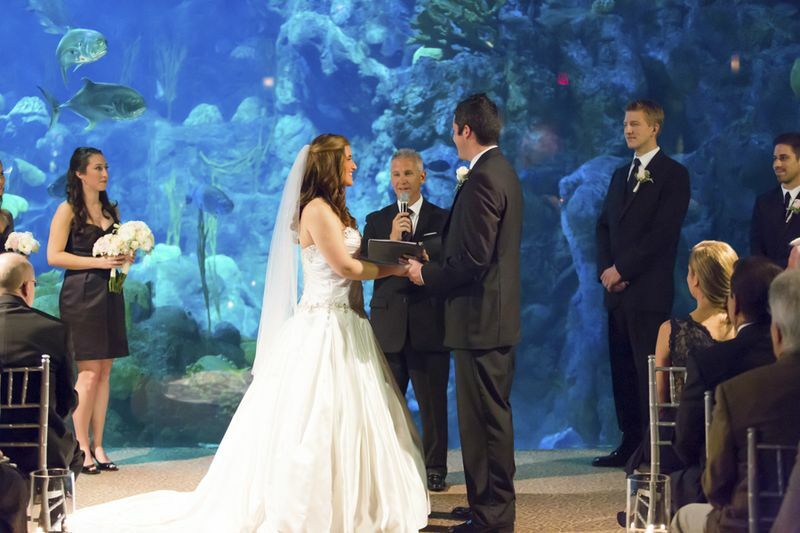 Lauren and Allen’s wedding ceremony took place at the beautiful Florida Aquarium in downtown Tampa in February. 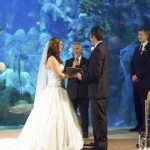 Lauren was escorted down the aisle by her father and mother to join Allen at the head of the aisle with the panoramic view of the coral reef in the aquarium as their backdrop. There, in front of their family and friends … and even a surprise visit from some penguins, the couple shared their vows, exchanged rings, and were pronounced husband and wife by Rev. Rick Lackore of Sensational Ceremonies, LLC . Their amazing team of wedding professionals included: Destiny and Light Hair and Makeup Group; Grant Hemond and Associates, Inc. and X Floral Salon all under the guidance of Natalie Melillo (Sales and Events Coordinator at The Florida Aquarium) and her excellent staff who made sure that every detail was taken care of for the happy couple and their guests. Wedding photographer Brad Hall from Brad Hall Studios provided this amazing image during their ceremony.